When a facility suffers damage from water, fire or microbial growth, documents stored within are susceptible to irreversible damage. Can paper and media be recovered? In today’s environment, preserving documents for business and historical purposes is not only a need, it is often the law. In many cases, retention of records is required for several decades. Additionally, some documents may have historical value to an organization. Documents and media that have become wet, moldy or have debris such as soot can be recovered. 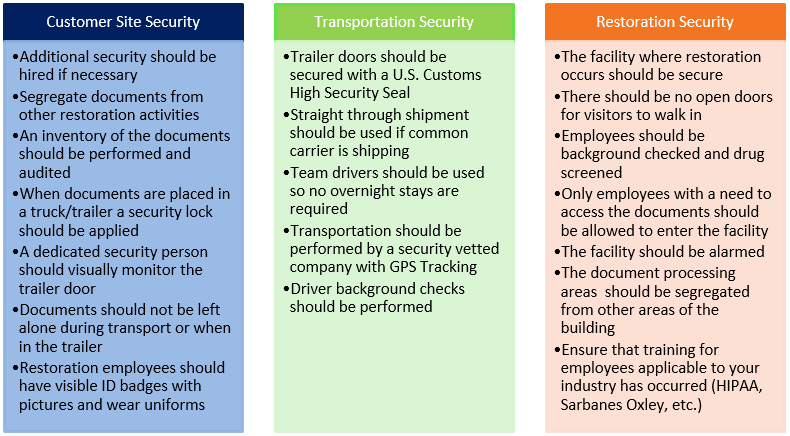 Often, these materials are highly secure and careful consideration must be taken to ensure that any company hired to handle records have proper security protocol in place. Such was the case when BMS CAT was hired to restore Top Secret documents damaged at an FBI facility during Hurricane Sandy. There are many reasons to clean documents off site. Typically, documents are not the only thing damaged, and the facility housing the documents usually needs repairs and/or restoration. While this may seem cumbersome, it allows for several benefits. Restoration and repairs can be performed freely without fear of further damaging documents or books. Documents are in a secure facility while cleaning, including cameras, supervisors and dedicated staff. Technicians have a dedicated facility for cleaning. Since local technicians are used off-site, thus eliminating the cost of housing and transportation, the cost to clean off-site is actually lower. When packing out documents, it is generally appropriate, to begin with, materials that have sustained the most damage. Site conditions may prevent this. Microfilm and other photographic negatives should not be allowed to dry out. The emulsions become soft when wet and will act as an adhesive. When these items dry next to paper or other films, the emulsions will stick to whatever is next to it permanently. Trying to pull items apart will destroy the film. The film should be placed in a plastic bag with a moderate amount of distilled water to keep items wet. Finally, film and other photographic materials should be stored at a cold temperature. When dealing with bound volumes, they should be packed “spine-down.” Large volumes should be placed flat in boxes. 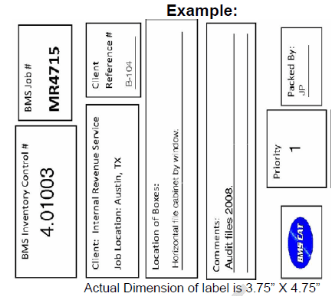 BMS CAT utilizes an inventory system that gives each box a unique number that will become its own identifier. The inventory number will tell us the building, floor, office (or cubicle) and how many boxes were removed from each space. On both the box label and corresponding spreadsheet, there is a section for comments describing the documents. Each box is labeled with two identical labels. All inventory information is consolidated into spreadsheets and provided to the customer. BMS CAT has extensive experience in document and special media recovery following a disaster. The cleaning portion can be performed to documents damaged by debris, char or soot. Water Damage: If the Moisture Content of the paper is less than 7%, documents can be cleaned without drying first. If Moisture Content is greater than 7%, documents will continue to sustain further damage as the water equalizes or wicks into the paper. Freeze drying is generally accepted to be the least damaging of all methods of drying wet paper. Fire & Smoke Damage: Documents damaged by smoke and soot are cleaned using “chemical sponges” made of pure latex rubber. Soot particles are removed from the edges of volumes and documents. Technicians use gentle sweeping motions, moving from the center out to the edges of the document. If necessary, HEPA vacuums will be used to trap additional debris. If odors exist, ozone may be used to neutralize the odor. Ozone should not be used, however, on archival or intrinsically valuable records. Each item is the first HEPA vacuumed to remove gross accumulations of mold and debris. The technician then uses a dry cloth and/or “chemical sponges” made of pure latex rubber to further remove accumulations from the surface. If books are damaged, the spine and foredge may be accessed and cleaned with a bottle brush or dry cloth (if necessary). Binders are not a good candidate for cleaning or retaining following damage. Instead, information from each binder is retained with the materials that were housed in that binder. Additionally, we photocopy or photograph the original information to prevent confusion when re-filing. If requested, BMS CAT will also replace file folders made of permanent-durable materials. The old file labels are retained and placed in a plastic bag and hermetically sealed and new file labels are applied to replace them. Documents that have been wet or contain mold should be cleaned and sanitized. An EPA registered biocide will be applied to the documents, specifically where visible mold growth has occurred. If documents are exposed to Class 3 Water (“Black Water”), they should be sterilized via Gamma Radiation. Black Water can include sewage, river water, water from area wide flooding and any water that has been present for extended periods of time. If documents will be returned to a healthcare setting, Gamma Radiation is recommended for the safety of patients who may have compromised immune systems. If there is any advance notice of potential damage, all possible protective measures should be taken such as covering items with plastic, raising furniture and protecting electronics. Additionally, consider permanent storage of certain valuable items (rare books, historical newspapers or long-term archival documents) in buffered, acid-free storage boxes.